Known for his generous gestures where Fossil Rim Wildlife Center is concerned, Jimmy Gosdin literally delivered the goods again this summer. 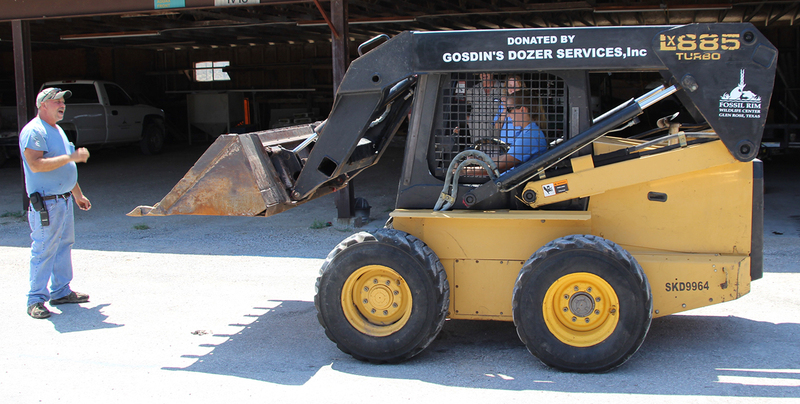 Gosdin, owner of Gosdin’s Dozer Service Inc. in nearby Rainbow, donated a skid steer to Fossil Rim in August. 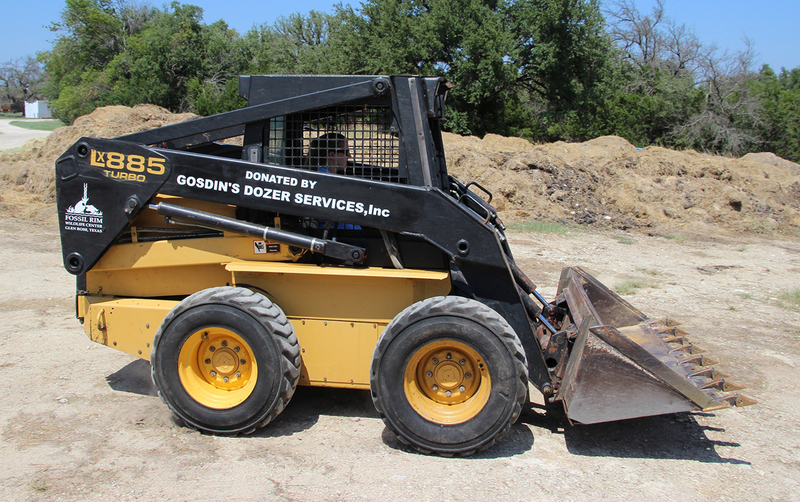 A skid steer is a small, rigid-frame, engine-powered machine with lift arms used to connect a wide variety of labor-saving tools or attachments. 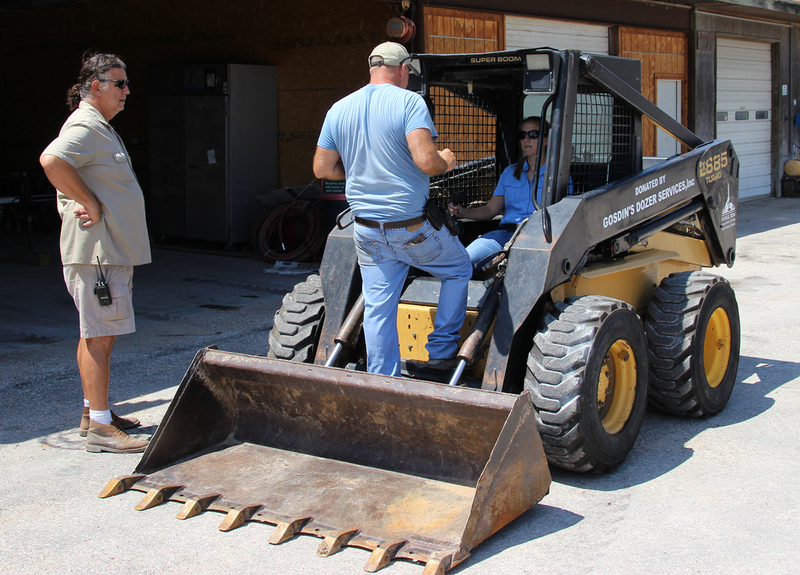 Jerry Monroe teaches Vanessa Hays how to operate the skid steer that was donated to Fossil Rim by Jimmy Gosdin of Gosdin’s Dozer Service Inc.
Fossil Rim Project Manager Louis Pienaar sees the new addition as a huge boost for what the park staff can accomplish on a daily basis. “A skid steer is one of the handiest pieces of equipment that you could have,” Pienaar said. “We’ve been wanting one for about 10 years to help with all of the work that we do. You can get a bunch of attachments for it to work on trenching, hole drilling, using the bucket, maintaining roads and ditches, cleaning out animal sheds, moving hay, sweeping the paved roads – the possibilities are endless for what you can do with this little machine. Up until now, we just haven’t had the resources to get one, so we would always rent one on a short-term basis, which is very expensive. 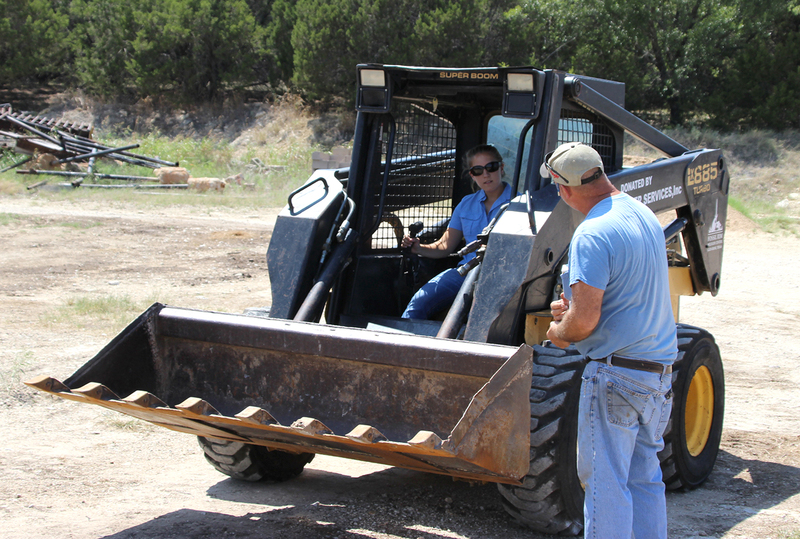 Jerry Monroe will make sure that any support services, animal care or natural resources staff members who need to utilize the skid steer are properly trained. Among other things, Natural Resources Specialist Vanessa Hays will use the skid steer to turn over the compost windrows. Projects Manager Louis Pienaar (left) is so excited about the donation of the skid steer. He called it the most versatile piece of equipment in the entire park. Pienaar said he will look to coworker Jerry Monroe to perform most of the staff training to operate the skid steer. Pienaar also said the natural resources department is riding high at the prospect of utilizing this new tool. 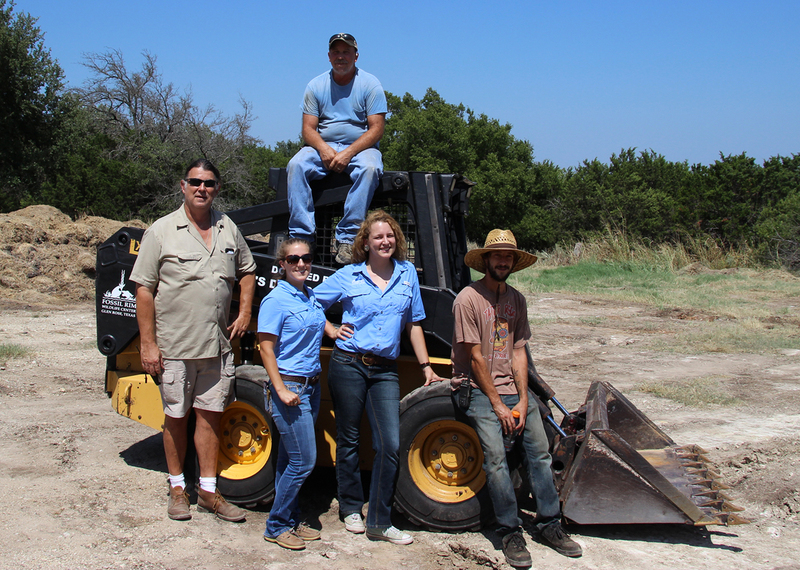 Staff members pictured who figure to utilize the skid steer often include (top) Jerry Monroe, (from left) Louis Pienaar, Vanessa Hays, Caitlin Pyle, and Chris Boyd. 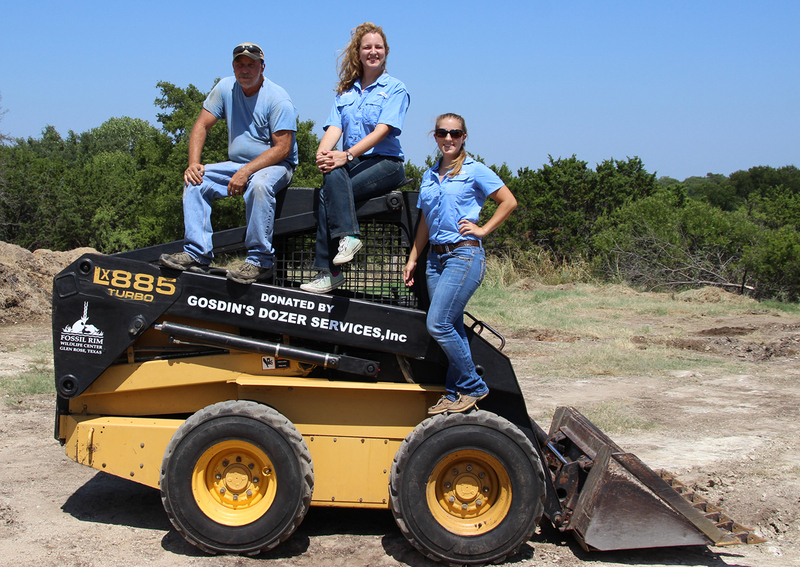 Fossil Rim Natural Resources Manager Caitlin Pyle was giddy the day the skid steer arrived. Even though tourism is going strong to fuel Fossil Rim’s engine, nonprofit organizations can always use a helping hand. “Being a nonprofit, every donation big or small makes a huge difference in allowing us to continue our conservation efforts,” Pyle said. Caitlin Pyle (middle) pointed out that even successful nonprofits like Fossil Rim get a huge boost from donations big and small. Pienaar hopes Gosdin understands how much his support boosts the capability of support services and other departments at Fossil Rim. “I have been borrowing a lot from Jimmy,” he said. “He’s been very kind to help us out. We are very proud for people to know that Jimmy made this donation.